Pictures of the front and rear of the DECMate. The insides are heavily stacked on top of each other, and it wasn't worth breaking it down for you to see. So sue me. 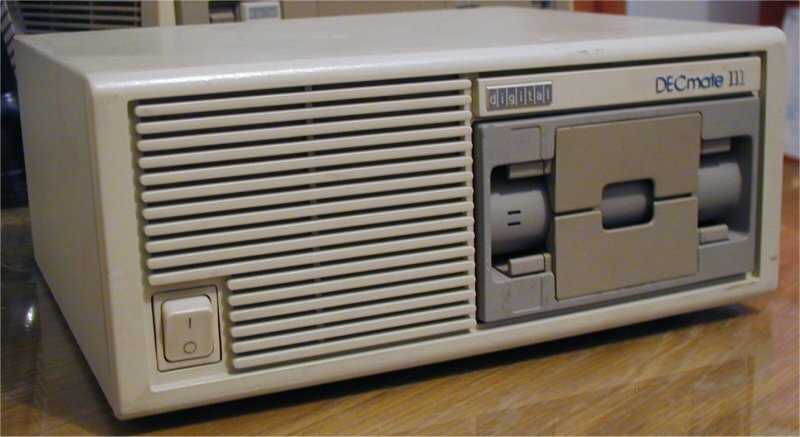 The DECMate was basically a PDP8 on a chip, in a much smaller package. From what I hear, Digital saw that all the expansion capabilities of the PDP8 were going mostly unused, and so they decided to produce a much smaller (and thusly, inexpensive) version without all that expandability. The DECMate III is an extension on that original idea, produced in 1984. The DECMate III came with a 8mHz 6120 CPU, and standard had a monochrome monitor. It's small, and heavy, and kinda ugly. And breaking it down takes a good length of time because of how its all stacked on top of itself. With an RX50 dual 5.25" and no hard disk, it wasn't much of anything. Somewhat interesting trivia is that the RX50, a back-to-back dual disk drive, actually only had a single rear/write head.